The number of massacres in history, for instance, are almost more than we can record. There was the New World holocaust, consisting of the extermination of indigenous Native American peoples throughout the western hemisphere, extending over four centuries or more, continuing into recent times in the Amazon region. Let us not forget the extermination of some 200,000 Filipinos by the U.S. military at the beginning of the twentieth century, the genocidal massacre of 1.5 million Armenians by the Turks in 1915, and the mass killings of African peoples by the western colonists, including the 63,000 Herero victims in German Southwest Africa in 1904, and the brutalization and enslavement of millions in the Belgian Congo from the late 1880s until emancipation in 1960—followed by years of neocolonial free-market exploitation and repression in what was Mobutu’s Zaire. Today in much of Africa, Central Asia, and the Middle East there are “smaller” wars, replete with atrocities of all sorts. 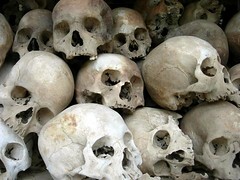 Central America, Colombia, Rwanda and other places too numerous to list, suffered the massacres and death-squad exterminations of hundreds of thousands, a constancy of violent horrors. In Mexico a “war on drugs” has taken 70,000 lives with 8,000 missing. There was the slaughter of more than half a million socialistic or democratic nationalist Indonesians by the U.S.-supported Indonesian military in 1965, eventually followed by the extermination of 100,000 East Timorese by that same U.S.-backed military. Consider the 78-days of NATO’s aerial destruction of Yugoslavia complete with depleted uranium, and the bombings and invasion of Panama, Grenada, Somalia, Libya, Yemen, Western Pakistan, Afghanistan, and now the devastating war of attrition brokered against Syria. And as I write (early 2013), the U.S.-sponsored sanctions against Iran are seeding severe hardship for the civilian population of that country. All the above amounts to a very incomplete listing of the world’s violent and ugly injustice. A comprehensive inventory would fill volumes. How do we record the countless other life-searing abuses: the many millions who survive wars and massacres but remain forever broken in body and spirit, left to a lifetime of suffering and pitiless privation, refugees without sufficient food or medical supplies or water and sanitation services in countries like Syria, Haiti, South Sudan, Ethiopia, Somalia, and Mali. Think of the millions of women and children around the world and across the centuries who have been trafficked in unspeakable ways, and the millions upon millions trapped in exploitative toil, be they slaves, indentured servants, or underpaid laborers. The number of impoverished is now growing at a faster rate than the world’s population. Add to that, the countless acts of repression, incarceration, torture, and other criminal abuses that beat upon the human spirit throughout the world day by day. The world’s dreadful aberrations are so commonplace and unrelenting that they lose their edge and we become inured to the horror of it all. “Who today remembers the Armenians?” Hitler is quoted as having said while plotting his “final solution” for the Jews. Who today remembers the Iraqis and the death and destruction done to them on a grand scale by the U.S. invasion of their lands? William Blum reminds us that more than half the Iraq population is either dead, wounded, traumatized, imprisoned, displaced, or exiled, while their environment is saturated with depleted uranium (from U.S. weaponry) inflicting horrific birth defects. The repetitious patterns of atrocity and violence are so persistent as to invite the suspicion that they usually serve real interests; they are structural not incidental. All this destruction and slaughter has greatly profited those plutocrats who pursue economic expansion, resource acquisition, territorial dominion, and financial accumulation. Ruling interests are well served by their superiority in firepower and striking force. Violence is what we are talking about here, not just the wild and wanton type but the persistent and well-organized kind. As a political resource, violence is the instrument of ultimate authority. Violence allows for the conquest of entire lands and the riches they contain, while keeping displaced laborers and other slaves in harness. The plutocratic rulers find it necessary to misuse or exterminate restive multitudes, to let them starve while the fruits of their land and the sweat of their labor enrich privileged coteries. The dominant socio-economic system today is free-market capitalism (in all its variations). Along with its unrelenting imperial terrorism, free-market capitalism provides “normal abnormalities” from within its own dynamic, creating scarcity and maldistributed excess, filled with duplication, waste, overproduction, frightening environmental destruction, and varieties of financial crises, bringing swollen rewards to a select few and continual hardship to multitudes. Economic crises are not exceptional; they are the standing operational mode of the capitalist system. Once again, the irrational is the norm. Consider U.S. free-market history: after the American Revolution, there were the debtor rebellions of the late 1780s, the panic of 1792, the recession of 1809 (lasting several years), the panics of 1819 and 1837, and recessions and crashes through much of the rest of that century. The serious recession of 1893 continued for more than a decade. After the industrial underemployment of 1900 to 1915 came the agrarian depression of the 1920s—hidden behind what became known to us as “the Jazz Age,” followed by a horrendous crash and the Great Depression of 1929-1942. All through the twentieth century we had wars, recessions, inflation, labor struggles, high unemployment—hardly a year that would be considered “normal” in any pleasant sense. An extended normal period would itself have been an abnormality. The free market is by design inherently unstable in every aspect other than wealth accumulation for the select few. What we are witnessing is not an irrational output from a basically rational society but the converse: the “rational” (to be expected) output of a fundamentally irrational system. Does this mean these horrors are inescapable? No, they are not made of supernatural forces. They are produced by plutocratic greed and deception. So, if the aberrant is the norm and the horrific is chronic, then we in our fightback should give less attention to the idiosyncratic and more to the systemic. Wars, massacres and recessions help to increase capital concentration, monopolize markets and natural resources, and destroy labor organizations and popular transformative resistance. The brutish vagaries of plutocracy are not the product of particular personalities but of systemic interests. President George W. Bush was ridiculed for misusing words, but his empire-building and stripping of government services and regulations revealed a keen devotion to ruling-class interests. Likewise, President Barack Obama is not spineless. He is hypocritical but not confused. He is (by his own description) an erstwhile “liberal Republican,” or as I would put it, a faithful servant of corporate America. Our various leaders are well informed, not deluded. They come from different regions and different families, and have different personalities, yet they pursue pretty much the same policies on behalf of the same plutocracy. So it is not enough to denounce atrocities and wars, we also must understand who propagates them and who benefits. We have to ask why violence and deception are constant ingredients. Unintended consequences and other oddities do arise in worldly affairs but we also must take account of interest-driven rational intentions. More often than not, the aberrations—be they wars, market crashes, famines, individual assassinations or mass killings—take shape because those at the top are pursuing gainful expropriation. Many may suffer and perish but somebody somewhere is benefiting boundlessly. Democratic victories, however small and partial they be, must be embraced. But the people must not be satisfied with tinseled favors offered by smooth leaders. We need to strive in every way possible for the revolutionary unraveling, a revolution of organized consciousness striking at the empire’s heart with the full force of democracy, the kind of irresistible upsurge that seems to come from nowhere while carrying everything before it. Michael Parenti’s most recent books are The Culture Struggle (2006), Contrary Notions: The Michael Parenti Reader (2007), God and His Demons (2010), Democracy for the Few (9th ed. 2011), and The Face of Imperialism (2011). For further information about his work, visit his website: www.michaelparenti.org. This entry was posted in All Posts News Politics and-or Videos, Dandelion Salad Featured Writers, Death-destruction, History, Imperialism, Massacres, Politics, War and tagged Genocide, Michael Parenti. Bookmark the permalink. This is one of the most incisive columns I have ever read. Notwithstanding murderous bloodthirsty crusades, orthodox pogroms and the demonic inquisition, it is clearly not all about organised religion, nor solely to be laid at the door of the debased temple of the West, although a strong argument can be made that its dominant coinage has certainly motivated excessive abuse, inhumane regimes that sanction atrocity. The Mongols’ merciless onslaught was not fired by christist dogma, nor were the random genocides of insane Chinese psychopomps. Something else is at work and remains endemic in the human estate. Why would the Aztecs delight in ruthless and obsessive sacrificial rites? Who told them it was the right thing to do? Wolin’s inverted totalitarianism is a brilliant concept, but it does not finally explain the fatal embrace of Thanatos and Eros to which Hedges alludes so persuasively. Moving beyond Freud, surely we can see the inevitability of human tragedy inherent in limitless procreation? The obvious ecological consequences are grave. There was originally a moral imperative to eugenics, that is now lost because of criminal intent assuming control of social agendas, appropriating false values, peddling ideology rather than enlightenment. The fact is it is too risky to engineer change, despite Plato’s espousal of the noble lie. We are not wise enough to lie well. Such a lie is not about base deceit, it is a type of existential paradox, that despite its alleged noble intent, is actually de-humanising, because it limits our options, if presented as an absolute, fixed ideal. Change should arise of necessity, from a deep awakening of the human spirit through natural initiation, and a profound aspiration to improve. There have been exceptional examples of a redeemed consciousness changing society, like Asoka for example, in India, who arrested his vicious ways and became a benefactor of mankind, not its arbitrary judge. David , redeemed consciousness is the only thing that will change a society . Anything short of that is only re-arranging the chairs on the Titanic . But …as the Greeks asked ”why ” , Galileo asked ”how ”. the question of the ”how” to change consciousness is where the game is . The Aztec and other indigenous tribes trouble with the understanding of blood sacrifice is that they don’t know the difference between forced bloodletting verses voluntary giving of ones blood for a deity . This can be seen in the writings of Greek tragedian Euripides . Compare and contrast ”Alcestis” and ”Iphigenia”. if a society , tribe , etc… thru war forces (via draft) young men to go off and die , they are feeding the beast in no different way than early man offered up for sacrifice their first born . However , and we are back to the inevitable difference between that and say Jesus of Nazareth CHOOSING out of his great heart of love to be a sacrifice . the latter is the game changer in regards to consciousness shift. you mentioned ”change of necessity”. to me that sounds very Maslovian . am i correct in assuming this ? also in regards to your view on ”natural initiation” …??? what does that mean , and how can that work in a finite person without the supernatural ? i do agree with you on the aspiration to improve . i think that that is built into us . also , i like your linking Thanatos and Eros . though as a Christian practitioner , i prefer linking Thanatos and Agape into one fusion of a deep implosion via sacrifice to others that exudes the beautific vision outwardly . there seems to be a more universality to it . For the most part, all these miseries have been created by Christianity. Vera, the gospel of Christ is the exact opposite of oppression. Christianity is against alienation and suppression of others. Men (and mostly it is men) have used religion and the name of Christianity to do all sorts of things, including murder, however, they are not following Jesus’ words. To state that “all” or even most massacres have occurred due to Christianity is not only inaccurate, it is said by someone who loathes God Himself, in my opinion.